Wow that's a good one and interesting. But then I can see the artists being upset if they "knew" the company was making lots of money off of their artwork... and the sting, so wanting a slice of that cash... but I am not sure if this is just more or less greed (like "HEY! wait a sec, you mean I can make TONS of cash?!?!?!") Unless they commissioned the work saying "no photos allowed unless you pay me"
commercial clip if we submitted it without a intellectual property release from the artist? Yup, this will be interesting. No I don't think that public work allows free use. Art and designs are protected. Buildings, plans and structures since 1991. ALso I'm sure the artists will claim commercial use. 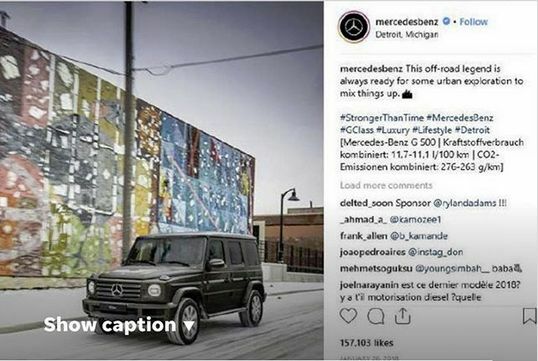 There is something called right of panorama which could be the MBZ argument, that they were just shooting photos of the cars and the building with art, is incidental. They had permits to shoot in that area. While I'm absolutely in favor of artists rights, they made the work. And I see this as commercial use. There's also an argument that the photos were made in a public setting, not featuring the art itself. I'm not buying the MBZ argument that the car transformed the art into something else. Their attorney might be claiming transformative appropriation, which has gone back and forth. I'm also against that, saying that stealing someone work and splattering new colors on it, makes it a new work. I don't know, but I wish I had better access to legal channels, I'd love to track this one. Why not approach the artists and pay them a reasonable fee? It would cost them less than the attorney's fees they must be paying for the lawsuit and it would be the right thing to do. Insane world we live in. 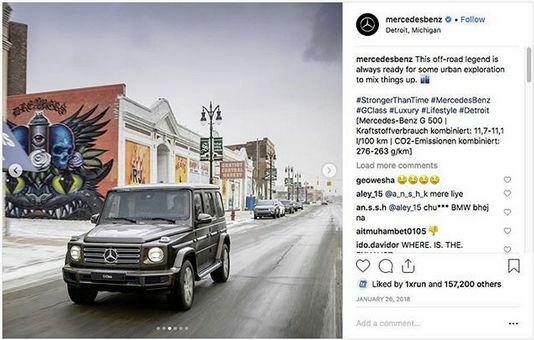 I would argue that it is a different situation than the right of panorama in that Mercedes, by their own admission, obviously chose to use the murals as a backdrop precisely to help them sell their cars and the murals are not simply incidental to the final image. Given their outrageous behavior in suing the artists, they ought to be paying them - ugh! Perhaps it is a matter of attitude. Who give more value to who. Is it the brand that highlighted the artist or vice versa. but executives that compete artists, and that is not exactly fair. Indeed crazy world. But it was always been this way. No wonder. Can we see deleted photo from Mercedes Instagram? Oh of course, should have paid from the start. I'm just kicking around the legal aspects. I'm not discussing what's right or wrong or if the artists should have been compensated, I think we agree yes they should have and that's the easy answer. I'm wondering what MBZ is using as a defense? The fact that they sued the people who should be suing is even more interesting. I'm guessing the Instagram posts in this article contain the actual photos in question. If so, they didn't substantially change a thing...they just drove past or parked the cars in front of the murals, which are clearly visible. Another one of their Instagram posts. So by extension a photo of eg. a Mercedes dealership with logos and cars could be sold commercially? Not sure what for, but probably someone could. The Eiffel Tower is OK during the day, but not when it's lit up at night, as the lighting designer has rights over that. Adobe and Shutterstock would reject for sure. all clips rejected for missing intellectual property release from the "artist". Going to be interesting. I can see value in both sides of the argument. Also: “Mercedes has made their choice and they will forever be on the wrong side of history. We will prevail just as we have in the past against other corporations who have tried to use these same bullying tactics against artists.” looks like a fairly strong prediction, but laws have a way of not representing the fair and obvious. Quote is from one of the artists. of the image below. Here's the complication, as I see it. Public street, public art, it isn't the subject, the art is incidental. I don't believe though that just because it's out in public, that causes the artists to lose their rights to their work. Somewhere between those statements and even more extreme views, is the answer. Are you the artist or the company? I am neither and I accept that both might have a case. I don't like appropriation of art or works, without payment. At the same time, not claiming free use because of location by any means! The use was on a Internet post, which may or may not be considered commercial or advertising? Considering the source is MBZ and they are featuring their product with the language they used, I think it's pretty heavy on the promotional or commercial side. But is it a post or just a pretty photo? I'll save some hunting and thanks again for the good links. This one is a larger portion of the composition. Sure looks like advertising to me, not just someone like myself posting "hey look at my car". For some reason I really want to photograph my mural with a Mercedes car in front of it, just in order to promote my street-artwork. What if there would be Banksy's mural on the wall... Would they sue him too? "One person struggled to sell their home, another had to remove wall. We meet the people whose lives changed after Banksy left his mark"
Great isn't it? That's what's going to make the case interesting. The industrial giant attacking some artists. I'd agree, I just point out that legal arguments may not be as easy or self evident as what pretty much anyone here will find obvious. I'm not buying the MBZ argument that the car transformed the art into something else. Yes and someone PMed me asking why I wasn't defending the artists for the obvious use without pay. I'm not taking sides or defending anyone, just looking at the case from an attempted impartial viewpoint. Of course MBZ should have paid the artists for the use, it would have been better for everyone. Maybe someone in corporate just wanted to run a multi-million dollar test case? Seems like a waste of money when they could have done the right thing in the first place, for less. Unless this is an end run to beat the artists to their own case? Perhaps sometimes we do have to pick a side. It is a matter of principle. And some possible bad res in the future. Go ahead pick a side, I agree, the artists should have been paid or should be. But I'm trying to look at the legal aspects, in which case, emotions and personal opinions are out. Is it that difficult or am I not explaining that part well? Mercedes can be morally wrong, ethically wrong and legally within the law. That's why this is such an interesting question and the results of the case will have extended legal ramification into the future. This is what the MBZ lawyer is claiming, gives them the right to use the murals. I still think it's a stretch and wrong, but now I see the basis. I think the MBZ lawyer is reading between the lines of the first part and not following the law in the second underlined portion. A building in a public place or visible from a public setting can be photographed without violating copyright protection of the building. The photograph can be published and used commercially without requiring the consent of the copyright holder of the building. Other forms of visual representation, such as a videotaping or drawing, are also permitted. This exception applies to architecture only. You cannot, for example, use a photograph of a copyrighted painting in an advertising campaign without permission from the copyright holder. If you photograph or film a building, make sure that no people are recognizable in a final image used commercially unless you have obtained their permission to be part of the picture. I wonder if they will just settle and pay the artists and end this? Could be a preemptive strike to avoid getting sued. End around. If the idea was to create a way to negotiate, without getting sued themselves, and reach an agreement with the artists? I just can't see the MBZ lawyer being serious about his defense that the building is in a public place. I also can't see them winning.